Four Generations descended from Galen Bullen Fisk and Sarah B. Robbins. Galen was listed in the census as a farmer and a drover (cattle driver). He died at his residence in South Thomaston, Maine. Galen Fisk was descended from Lord Symond FISKE, who was born about 1399 in Stadhaugh, Laxfield, Suffolk, England. Galen's father was John Fisk, #3792-1 in the Fiske and Fisk Family book written in 1896 by Frederick Clifton Pierce. The Fiske family may have descended from the Vikings who invaded eastern England around 800, and many settled there. Most of this Family History is of Galen's son Lewis Sherban. The following is a note written by Lewis Sherban's granddaughter Iva Nora Flanery. "Lewis Fisk and brother George Franklin came from Rockland, Maine about 1854 and eventually settled in Pleasant Hill, MO. where they operated a butcher shop. Lewis entered service during the war of Rebellion (Civil War) the 31st of July 1862, at the age of 23, as private of company K of the 9th Regiment of the US Calvary. He furnished his own horse and horse equipment. 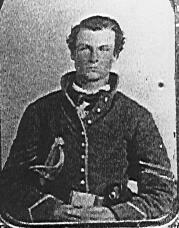 While on scout duty in June of 1864 his horse was shot out from under him. He crawled and hid in a hollow log. He was discovered after an absence of 3 weeks with a broken right foot and sore eyes. He was promoted to sergeant and returned to duty. Due to complications of the foot he was honorably discharged the 24th of June 1865. He was awarded a medal for bravery under fire. Grandpas feet never healed properly, he limped the rest of his life. During a lightning storm, Grandpa was sitting with his foot propped on a wood stove. Lightning struck and knocked Grandpa off his chair. This may have contributed to his death a few days later. " Anyone wishing to add or inquire more information of this history please contact me. Tips for starting your own Family Research and some helpful links.